One of the projects we love doing is helping a family capture and preserve their history. 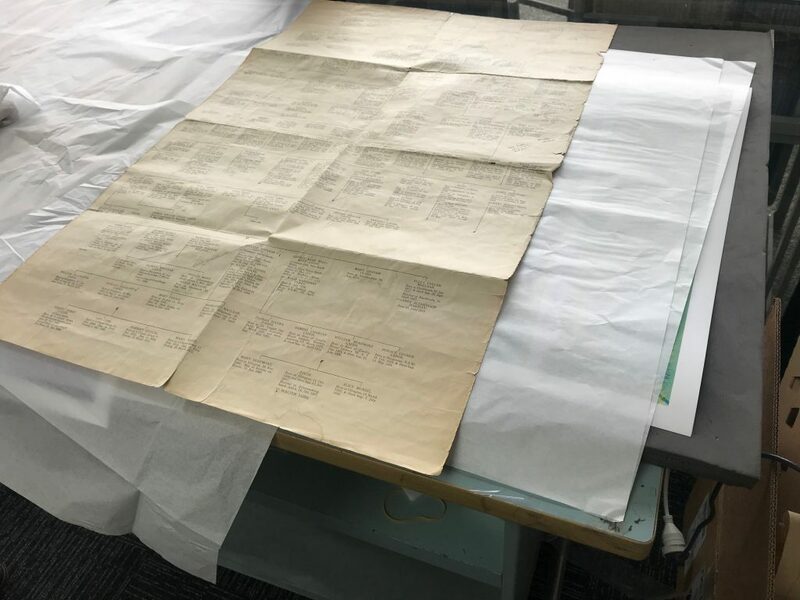 Our Wellington team has recently digitised two historical family tree documents for one of our clients, John Christie. 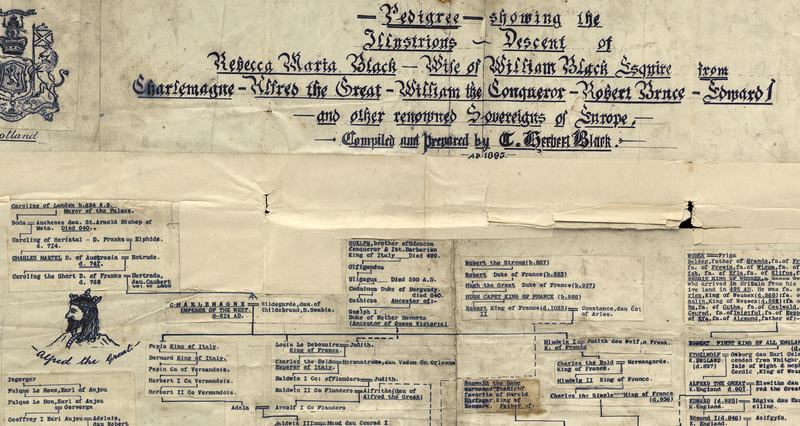 The first tree is titled –“William Laddes, of Barham, Hunts” dated June 1915 which includes John’s Grandmother, Phillis Mary and depicts his family history on one large paper document. The second tree we digitised for John had a different story, this tree illustrates the family history and descent of Rebecca Maria Rolland. This historical document belonged to and was treasured by John’s Grandmother, Phillis however the family connection to this tree and Rebecca is unknown. John tells us “It’s a complete and utter mystery as to why my grandmother had this tree.” He plans to investigate why his Grandmother owned this tree, where it came from, who is Rebecca Maria Rolland and if there is any family connection to her? This second family tree was also very intriguing to our team due to the unique construction of it with multiple paper types and inks depicting family crests and illustrations. This tree is titled – “Pedigree – showing the illustrations – Decent of Rebecca Maria Black – wife of William Black Squire from Charlemagne – Alfred the Great – William the Conqueror – Robert Bruce – Edward 1 and other removed Sovereigns of Europe. Compiled and prepared by C. Herbert Black, AD. 1895”. 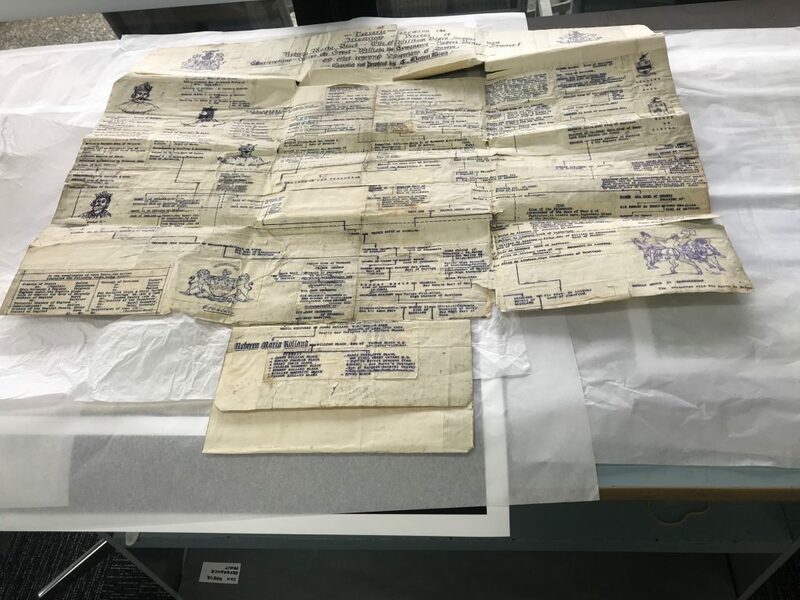 As these family trees are extremely fragile and delicate to unfold, we carefully scanned both documents at our HMIF (Heritage Material Imaging Facility) in Archives New Zealand on the Cruse CS185 Scanner. 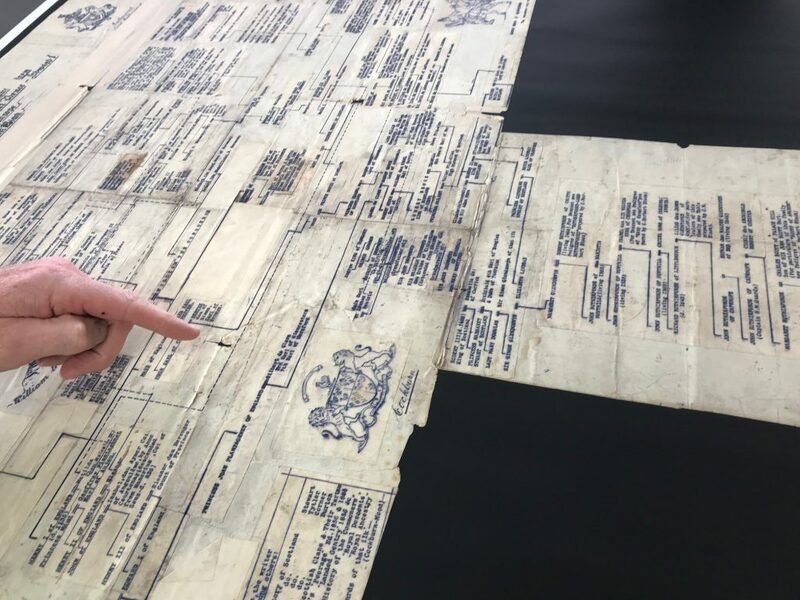 This scanner was chosen due to the size and fragility of the material and the ability to capture all text, folds and textures of the original document without having the need for any glass or contact pressing down on top of the fragile document. This allowed us to provide John with high quality tiff digital images of the trees. Giving him easy access to the trees for further family history research without having to unfold the tree multiple times which could potentially cause more damage and risk of losing information. Not only did we provide John with the digitised files we also printed a copy of each tree on our large format printer, which produced a paper reproduction of the tree in so much detail and high resolution quality that all the text, folds and creases in the original document are shown in superior clarity, giving John another level of access to research from.Digitise your family trees with NZMS to preserve and protect your family history, contact us today.